In this episode Shahriar takes a close look at one of Keysight (Agilent) InfiniMax III active probes. The model N2802A offers 25GHz of analog bandwidth, 17.5pS of rise time and a total differential input capacitance of 32fF at 10k-Ohm input impedance. The front-end amplifier of this active probe is designed in an in-house InP process, the same process responsible for the front-end of the X-Series Keysight oscilloscopes. 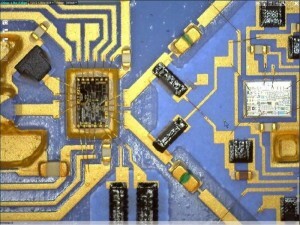 The teardown of the probe shows the control circuitry in the main probe body built around a PIC 16F877 microcontroller coupled to a DAC, EEPROM memory and various high-current and precision op-amps for biasing. The main front-end microwave module reveals the InP ASIC and supporting microwave circuity. There seems to be a dual-path design to provide a large DC common-mode offset capability as well as a high-bandwidth. Can you post the close up pictures? Did you notice that the probe body at the scope side has two external buttons, but three internal ones? What do you mean by “three-five” process? Thanks Shahriar. Very much appreciate your generosity with both your time and the money you spent just for the teardown. I enjoyed the journey into something I would very rarely get the chance to see. Thanks Shahriar — not something we ever get to see. Good work.